Game for two people. Split up the cards evenly. Each person sits with their pile upside down in front of them. 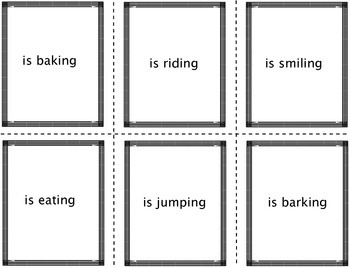 One at a time, students flip their cards to the middle so that both people can see the words on the other side. 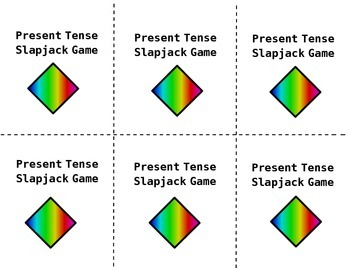 If it is a present tense verb, the first one to slap the card gets to take all the cards in the pile. If the word is not a present tense verb, they leave the cards their and flip the next card in order. 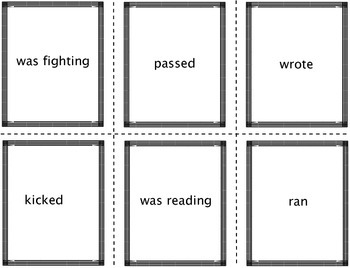 If a student accidently slaps a card that is not a present tense verb, they have to put all of their cards back in the pile in the middle. When all the cards are gone, the one who has collected more cards is the winner.